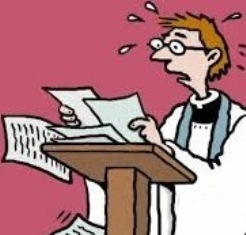 In our parish church, bringing loose sheets to the ambo is discouraged for the lectors. Lectors are supposed to proclaim the scriptures and the scriptures are best read from the lectionary. The lectionary is in a more respectable form than the loose sheets like the common Sunday missalette leaflets. The responsorial psalms and verses appear in the lectionary. Unfortunately, the missalette has the advantage in that the responsorial psalm contains the musical notation that the choir can use. The musical notation is a simple melody of the responsorial psalm and has the chords as well. Of course, the choir has the option not to follow the melody, but in general, they do. The psalm verses follow the response. They just appear as text and do not have music notation. So it is up to the psalmist to chant or sing the verse in a simple tune. The psalmist can work with the choir for an acceptable and appropriate tune. A sample of the music notation for the psalm response appears in this article. In a previous article, I briefly mentioned how I'm able to able to print the responsorial psalm and verses without having to buy the missalette. Missalettes can be bought inexpensively, but for me it is still not feasible. So what I do is to print just the responsorial psalm from the missalette and use that printout when chanting the psalm at the ambo. I'm able to edit it and make the font size more readable. Plus, I'm able to put in more notes of my own to aid me in the chant. At the first time I chanted the psalm on a regular Sunday, I brought the printout with me. Before I left the house, I folded it and put it inside my pants' front pocket. When it was time for me to take out the printout at church, it was a bit crumpled. After unfolding the paper printout, I had to lay it really flat with my fingers on the reading surface of the ambo. Still, some of the words in the text have become unrecognizable because of the creases on the paper. I also realized that I was too conscious about fidgeting my arms when taking out the printout from the pocket and returning it. Another is the action to unfold the printout and lay it flat on the ambo's reading surface. All these actions may seem subtle, but are still visible to the congregation, especially those viewing from the ambo's sides. On the second time I chanted the Sunday mass psalm, I decided to leave the paper printout of the psalm on the ambo right before the mass. This would eliminate the creased paper and wrinkling problem. But it would also mean not folding the psalm paper printout. So I just left the paper as a bookmark to the lectionary. The psalm chanting went well. But the officiating priest probably wondered what that piece of paper was upon seeing it when he closed the missalette for the Prayers of the Faithful. In the continuation of this article, I will discuss a better option of bringing the psalm paper printout and reading it easily, without the fear of losing it.